IF result (nuclear and the base of cilia stain) of anti-BBS10 (12421-2-AP; 1:50) with hTERT-RPE1 cell (PFA fixed) by Dr. Moshe Kim. BBS10, also named as C12orf58, belongs to the TCP-1 chaperonin family. It is probable molecular chaperone. Assists the folding of proteins upon ATP hydrolysis. 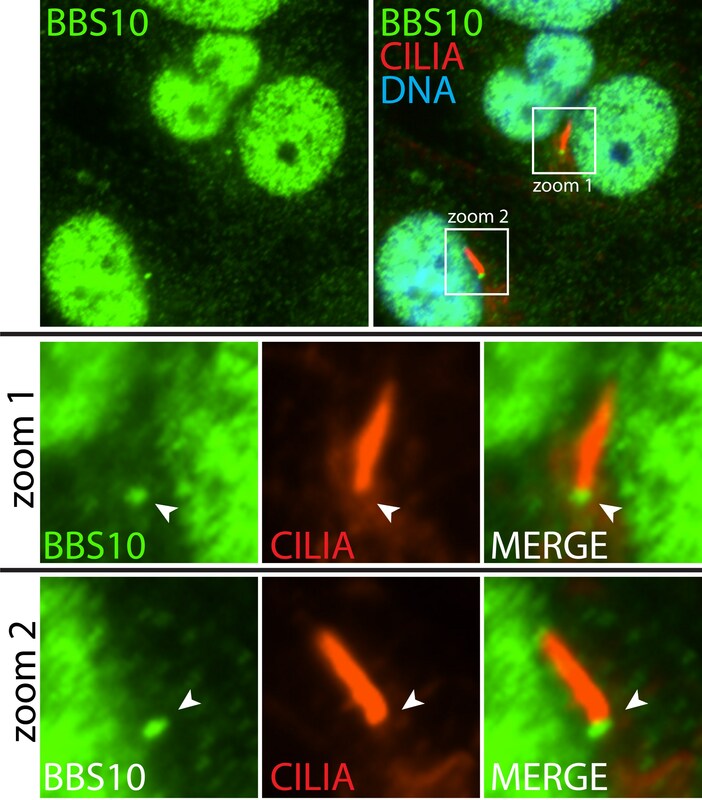 As part of the BBS/CCT complex, BBS10 may play a role in the assembly of BBSome, a complex involved in ciliogenesis regulating transports vesicles to the cilia. Involved in adipogenic differentiation. (PMID:20080638,19190184) Defects in BBS10 are the cause of Bardet-Biedl syndrome type 10 (BBS10). Transient ciliogenesis involving Bardet-Biedl syndrome proteins is a fundamental characteristic of adipogenic differentiation. Comparing the Bbs10 complete knockout phenotype with a specific renal epithelial knockout one highlights the link between renal defects and systemic inactivation in mice. BBS6, BBS10, and BBS12 form a complex with CCT/TRiC family chaperonins and mediate BBSome assembly.